Australian maxi yachts Wild Oats XI and Raggamuffin have finished one of the world’s oldest and longest yacht races in record times. 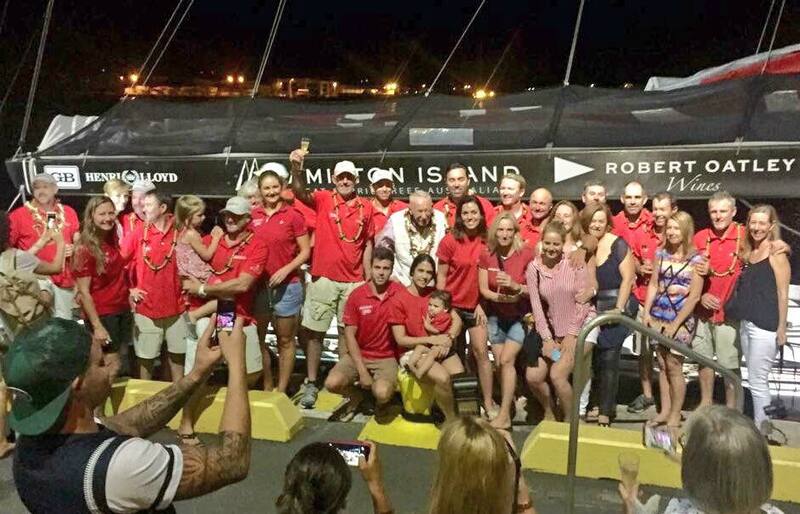 Wild Oats XI completed the 2,225 nautical miles(2,560 mi; 4,121 km) Transpacific in 6 days 10 hours 37 minutes 02 seconds (Corrected Time: 6:12:37:38) while Raggamuffin 100 has completed the race in 6 days17 hours:26 minutes (Corrected Time: 7:07:00:41). Transpac tells us ‘There are no official results until all of the boats are in’ but Preliminary Results show these Australians have done exceptionally well in what has been a challenging race. Rob Mundle OAM, sailor, author and journalist, has been posting daily reports throughout the race on Wild Oats XI progress, cataloguing barely a breeze at the start, a helmsman being hit in the face with a flying fish while cleaning his teeth and the supermaxi having to negotiate its way through a mass of flotsam and jetsam. “I’ve never seen so much rubbish in the ocean. It was everywhere we looked. “navigator Nick Whitesaid on July 23rd. Started in 1906, it is one of yachting's premier offshore races famous for fast downwind sailing under spinnaker in the trade winds and attracts entrants from all over the world. The Transpacific Yacht Race (Transpac) is a bi-annual event that commences off San Pedro, Los Angeles at the Pt. Fermin buoy, and ends off Diamond Head Lighthouse in Honolulu. The race is organized by the Transpacific Yacht Clubwho can trace its founding to a letter challenging California yachtsmen to sail to Hawaii from King Kalakaua in 1886. In 2013, the fully crewed monohull, Dorade, won first overall, making it the oldest boat in the fleet to win and a 2-time winner, having won the Transpac in 1936, 77 years prior. Raggamuffin 100 also raced in 2013, placing 3rd in the seven yachts racing in Division 1, which may be her Official Result this year too. Wild Oats XI is a joint entry in this race by Australian owner, Bob Oatley AO, and American Roy P. Disney, who was co-skipper with Pittwater’s Mark Richards. Roy P. Disney is a son of Roy E. Disney whose Pyewacket, a 73-foot maxi ultralight designed by Reichel/Pugh, in 1997 set a new monohull elapsed time record of 7 days, 11 hours, 41 minutes, and 27 seconds. Roy E. Disney sailed in 15 Transpac's over 30 years before retiring from racing in the Transpacific. Since 1949 the fastest in the fleet have traditionally competed for the unique Transpacific Yacht Club Perpetual Trophy -a 3 1/2 x 4-foot plaque of hand-carved Hawaiian koa wood---better known as the "Barn Door." Smaller boats unable to match the larger ones in sheer speed compete for a prize more reflective of crew performance: the King Kalakaua Trophy, a metallic model of a sailing canoe, for the best corrected handicap time. TRANS PACIFIC YACHT RACE VICTORIAN ENTRY - WOMAN JOINING CREW. MELBOURNE, Apr. IB.-The sister of the bachelor owners of a? ketch which left on a 7000-mile journey to Los Angeles to-day made a snap decision five hours before sailing time to go with them. She was Miss Emily Livingstone, of Urratum Station, near Mt Gambier. Her brothers, Frank and John Livingstone, pastoralists, will contest the 2200-mile trans-Pacific yachtrace from Los Angeles to Honolulu! in July in their 58-ft. ketch Kurrewa III. Miss Livingstone said: "I had no intention of making the trip, but the cook signed off at the last minute and I decided to take his place. However, I am not sure whether I will stay on after. Auckland. I will just see how things go." Hurricanes, cyclones, minefields, and the 'officially missing' notice have not daunted the South Australian-bunt Kurrewa III from racing in the most famous yacht races in the world. Kurrewa placed 16th in a field of 24 yachts. Since that time Sydney yacht Solveig has raced(1951: co - skippers, Trygve and Magnus Halvorsen) and Astor (1963 , owned and skippered by Peter Warner) has also put in a good showing. Honolulu, HI – The Barn Door Trophy is made from a large ornately-carved piece of Hawaiian Koa wood, and is an iconic symbol of excellence for the Transpac: many of the most famous racing yachts in the world of offshore sailing have their names inscribed on the brass plaques around its perimeter. In 2009 when the existing course record was smashed by over a day by Neville Crichton’s canting-keeled Alfa Romeo, Transpac YC recognized that this class of designs was unique and needed its own trophy, so the Merlin Trophy was born to honor the boat that did so much to encourage high-speed offshore-capable design. Today the names inscribed on the 2015 plaques was determined at the Transpac’s Diamond Head finish line: Roy Pat Disney’s and Bob Oatley’s Wild Oats XI had the lowest elapsed time on the course to win the Merlin Trophy, and the first monohull without powered assistance was Manouch Moshayedi’s Rio 100, who will win the Barn Door Trophy. “What a machine; what a ride; what a crew,” shouted an elated Disney as they docked inside Honolulu’s harbour to the cheering and clapping of an adoring crowd of family and supporters. Disney has 21 Transpacs to his credit. Disney and skipper Mark Richards assembled an international pro team of 16 sailors for this campaign. A proud and extremely happy Bob Oatley was on the dock to welcome the team. As much as the 87-year-old wanted to be part of the race, his health prevented him from doing so. Being on the dock to salute the success was the next best thing. A few hours later Syd Fischer’s Ragamuffin 100 crossed the finish, runner-up to Oats. This was the second Transpac for ‘Rags’, which is actually in modified form from when she last raced here in 2013: she is narrower and lighter, but not enough to match Oats in the downwind VMG sailing common to this race. Explaining Rag’s decision to go far north in the hunt for more wind, helmsman Matt Allen said “We had a choice: go down the middle with Oats and follow her and lose, or head north and try to find more pressure to get around her on the top of the course.” Ragamuffin sailed with a pro-am mostly Australian team of 20 crew. Several hours later Manouch Moshayedi's Blakewell-White-designed, Kiwi-built Rio 100 sailed across the finish line, sailed by an international pro-am crew of 19 as the first monohull equipped with only manual-powered systems to sail the 2225-mile course in the shortest elapsed time. Their finish time – at 3:30 PM Hawaii time – was several hours from breaking the current Barn Door record of 6D 19H 44M 28S set by Hap Fauth’s 74-foot Belle Mente back in 2011, but by all accounts this year’s difficult race weather was not favorable to many boats in the fleet, so Moshayedi was still pleased. Tactician Gavin Brady said he’s been on many successful offshore race teams, but this one was both well-coordinated and congenial, a feat not easy with 19 people, one of the largest crews in the race this year. Other finishers in the last 24 hours included Paul Stemler’s J/44 Patriot, who in Division 7 is a runner-up in corrected time to Harry Zanville’s Santa Cruz 37 Celerity, who is still leading overall in ORR corrected time scoring; Tracey Obert’s BBY 59-foot ketch Marjorie, the first to finish in Division 8; and Drew Belk’s Beneteau First 40 Precepts II. On the eastern horizon within range of the live 100-mile tracker and due to finish some time tonight or tomorrow morning are the following boats: Dave and Peter Askew’s R/P 74 Wizard, who as ex-Belle Mente still holds the Barn Door record and is currently leading Division 2 in corrected time; Ross Pearlman’sJeanneau 52 Between the Sheets in Division 8; Alex Farrell’s 1D35 Alpha Puppy in Division 7; Joel Young’sBeneteau 523 Transformer in Division 8; Sam and Willie Bell’s Lapworth 50 Westward; and Pat Benz’sGunboat 66 Extreme H2O, the first multihull to finish the race this year. For those that wish to follow finishers on the Yellowbrick tracker system for when they arrive within 100 miles of the finish, there is a real-time window set up at this link: http://yb.tl/transpac2015-Finish. 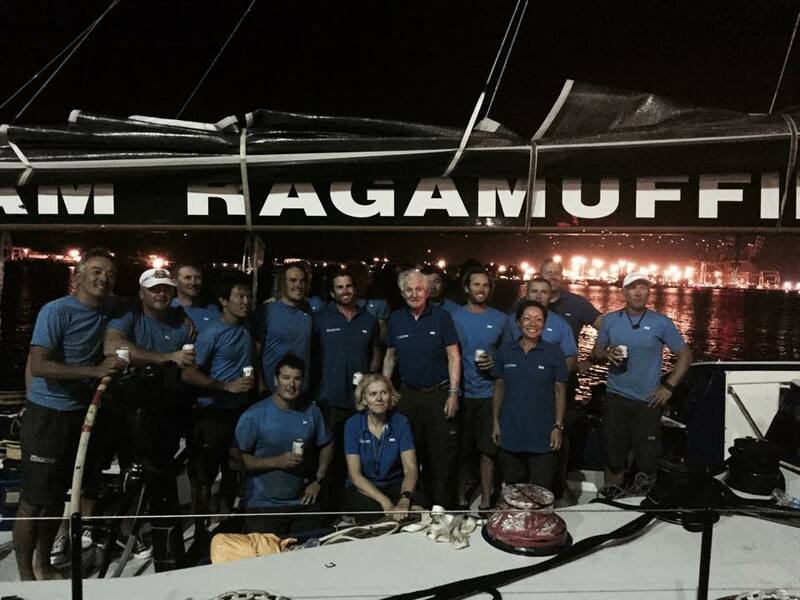 For other entries still on the course the tracker has a 6-hour delay and is found at http://yb.tl/transpac2015. Daily race analyses videos made by Seahorse Magazine USA editor Dobbs Davis are viewable to the YouTube link from the Transpac YC home page. The remnants of the Wild Oats XI crew (those still in Honolulu) seen here receiving one of their trophies at the Transpac Race awards ceremony last night. Roy Disney (who shared the entry in the race with Bob Oatley) is holding the trophy (his son is with him). "Oats" won "Overall Elapsed Time", 1st on corrected time in the 100ft class, and first foreign yacht on elapsed time. Navigator, Nick White, received the Navigator's Trophy for the division. "Oats" is now sailing 4300nm back to Sydney. Pic is from Sharon Green/Ultimate Sailing - post courtesy Rob Mundle. Report by A J Guesdon and Transpac Images courtesy Todd Rasmussen and Sharon Green, 2015.